From Okotoks to Panorama what a journey this was!!!!! 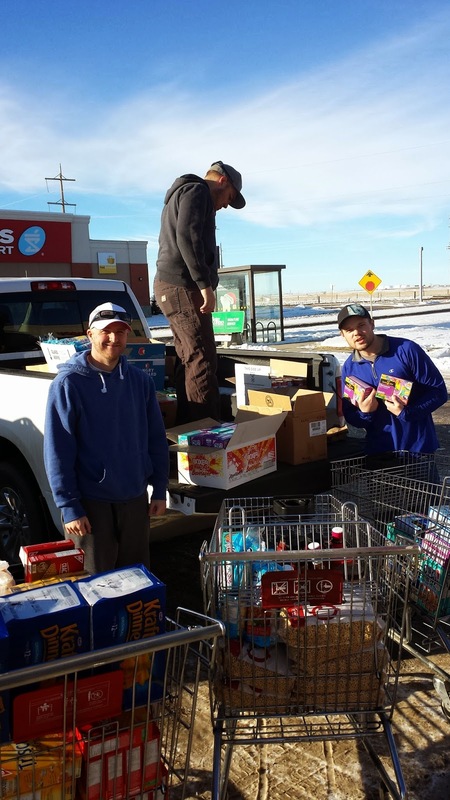 Our delivery of 47 skids (27,000 pounds) to the Calgary Food Bank on December 17th was made possible by the generous donations from the following businesses: Fluor Cares, save-on-foods, Heinz, Lake Bonavista Promenade. Mika Trucking, Pammatoor Transportation, Canadian Transport Trailer, Westpoint Construction, Bess Tank Lines, Consolidated FastFrate. As well all the businesses who had food collection boxes in their lobbies Desa Glass, Mid West Survey, Chief Hauling/Gibson Energy, Style Craft Printing, Hill Bros, J&R Hall, Day & Ross Dedicated, and of course Rosenau Transport. Without your continued support 18 Wheels of Christmas could not possibly have done this. We are constantly asked why we do this. 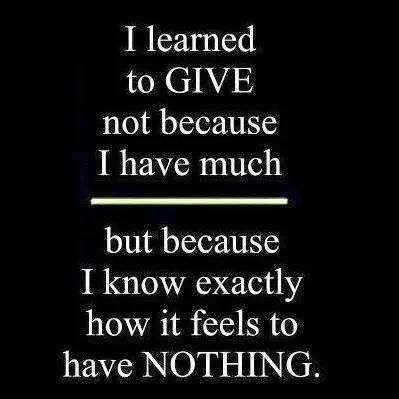 Why we give up our time and energy for people we don’t know. But we do know these people. This is our backyard, we live here, work here, play here, these people are our neighbors, co-workers, friends, perhaps even relatives. The majority of people are a pay-cheque away from financial ruination. No one knows when a catastrophic event will happen and how it will change a family’s dynamic. It can happen to anyone, even you! We do this to help ease the stress of an overburdened mother trying to put dinner on the table with nothing in the cupboard and no income. To ease the decision of pay rent or buy groceries, pay the heat or buy groceries the list goes on. Even in our prosperous country there are events which can turn a family’s entire world upside down. This is why we do this! The food collected in our backyard stays in our backyard to help the people where we live! It is unfortunate there is a need for agencies such as food banks but for the people who have had to access them they are very happy they are there. These agencies have programs such as the Lunchbox program, Breakfast for Kids program to help ensure children do not go to school without something substantial and nutritious in their tummies or lunch bags. These agencies also help with the Veteran’s Food bank, The Community Kitchen and a whole network of organizations ensuring people in need of a hand up have access to food to help them through a difficult time. We cannot close this campaign without thanking our volunteers. Ron and his men in the shop, Wayne, Trevor and all the creative designers in the Graphics Department, our drivers Lyle, Chris, Jonathon, and Mark for volunteering their Friday nights and Saturdays to make sure the trailer arrives at each destination and gets home again. Janet, Kent, Colleen, Dale, Chris, Diana, Tara-Lynn, Kathy, Julie, Mark, John, Ken, Martin and last but not least Jodi. Without each and every one of you this would not be possible. Thank you for your time, your ideas and mostly for your enthusiasm!!!! 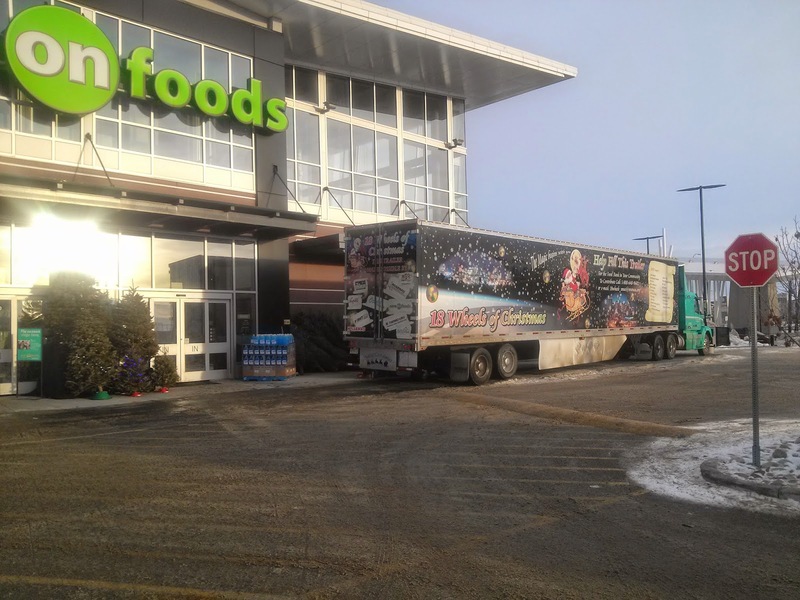 We have officially wrapped up the 18 Wheels of Christmas campaign in Medicine Hat for the 2014 season. 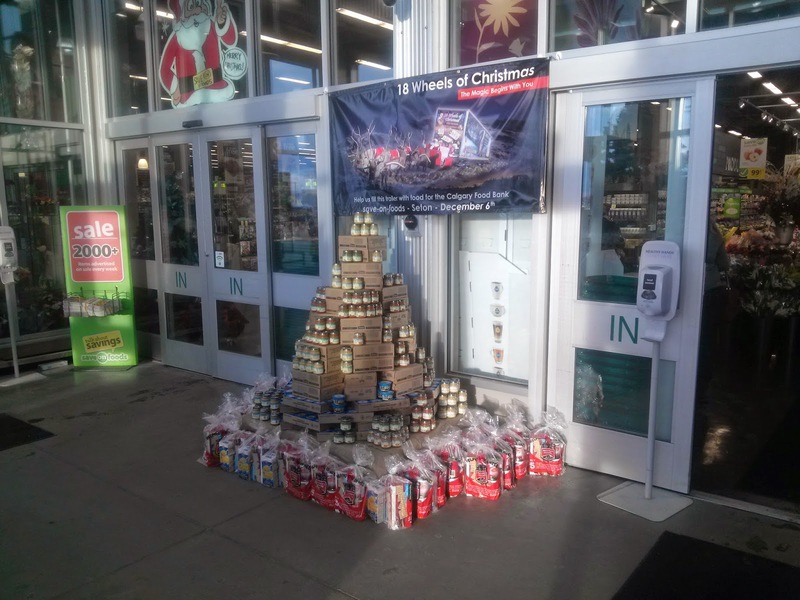 We had another great year of support from the people from the community as well as corporate partners to help raise food and cash donations for the Medicine Hat and District Food Bank. 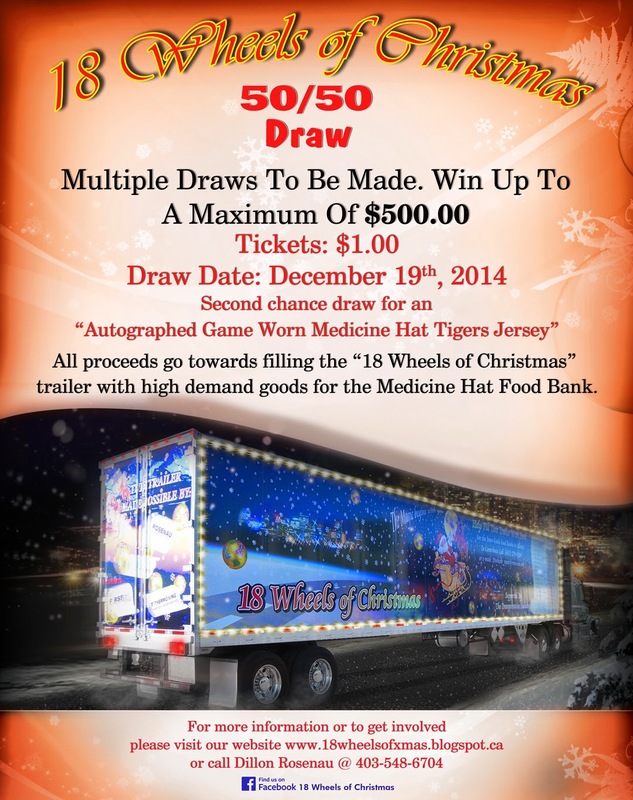 This was our 2nd year organizing a 50/50 draw which bought in over $1700, plus we gave away a signed Medicine Hat Tigers jersey to a lucky winner in a 2nd chance raffle. Parry Davis one of our drivers, stood out by selling the most raffle tickets totaling $600. All of the money that was collected from the 50/50 raffle draws was used to purchase groceries. 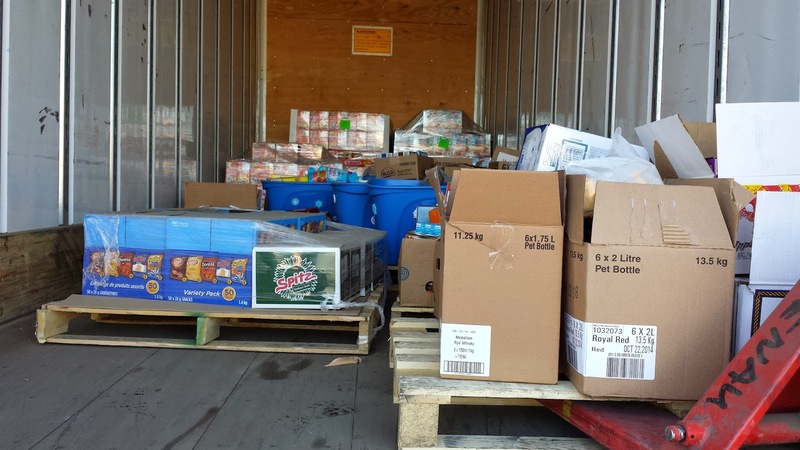 Altogether, we were able to give to the Medicine Hat and District Food Bank 12 skids of food weighing in at 5000 lbs. and $2500 that was donated by Rosenau Transport Ltd.
We would also like to thank Cypress Stake and Lath & the Medicine Hat Co-op for their generous contributions this year! And thank you to everyone who helped out this year by donating food, money or their time to help those in need in our community. How many times have you stood in the potato chip isle at the grocery store because you have the munchies and you can’t decide what flavour you want? Or you just simply can’t decide so you buy two different kinds. Have you ever actually looked in your grocery cart to see stuff that you are buying that you don’t really need, but you are buying simply because you WANT it? I know I am GUILTY, are you? 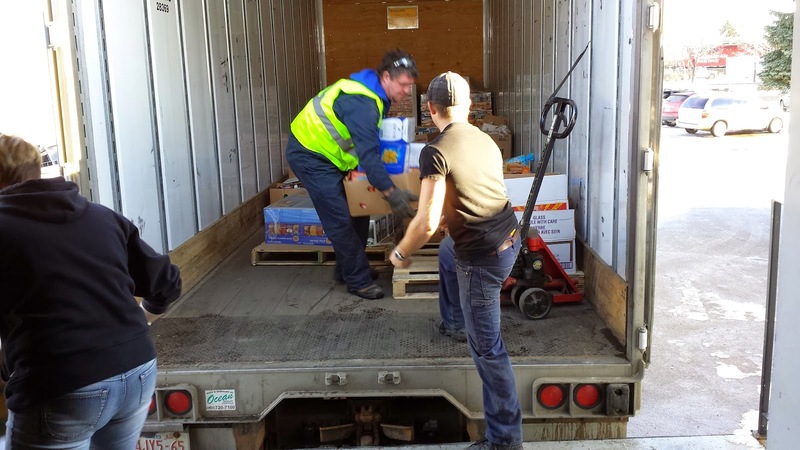 Today, the 18 Wheels of Christmas delivered $16,000.00 and 10 boxes of food to the Edmonton Food Bank, and it was the reality check I needed this holiday season. There were dozens of people coming in, most with young children in tow, to pick up their food hamper. And the numbers are quite staggering. 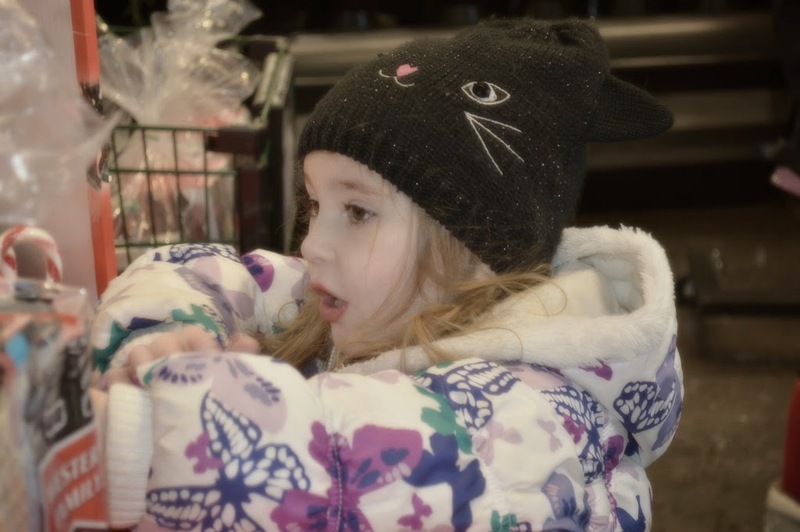 This year, in Edmonton alone, there are 15,000 individuals per month, involved in the food hamper program. Their numbers for the snack program are up to 410,000 individuals, up from the 350,000 individuals they had last year at this time. 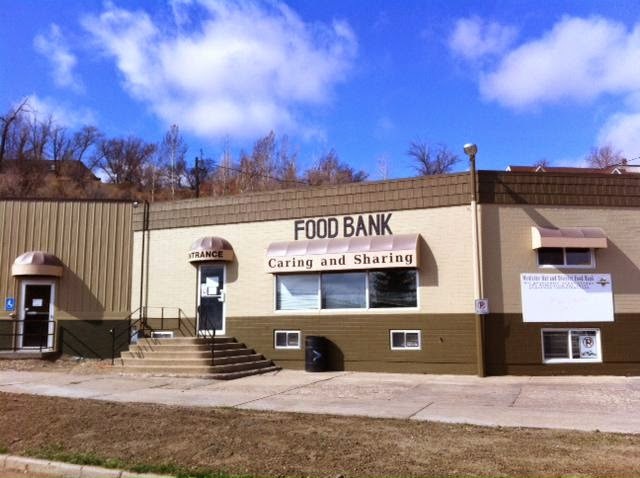 The Edmonton Food Bank is at 81% of reaching their food goal and at 61% of reaching their monetary goal for their holiday campaign. And there is still time to help out. This year’s holiday campaign ends January 9th. So please, I challenge you, while you are out finishing up your last minute Christmas shopping, and buying your groceries for your big Turkey feast, remember those that will go without this Christmas. Put a little something extra in your cart and drop it in the Food Bank donation box as you go through the exit. This would be a first on a couple of levels. 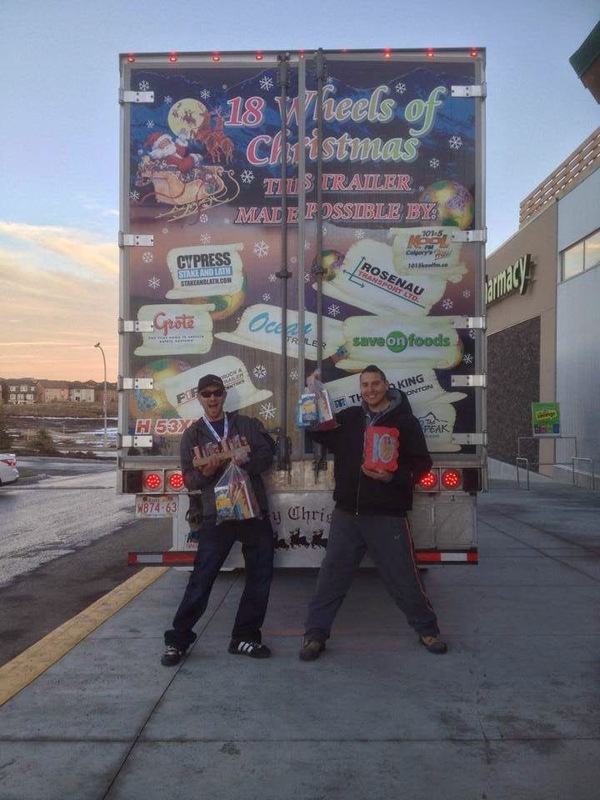 A first for 18 Wheels of Christmas (Calgary division) having a celebrity live in the trailer until food donations forced him out and a first for Can Man Dan to do this in Calgary. 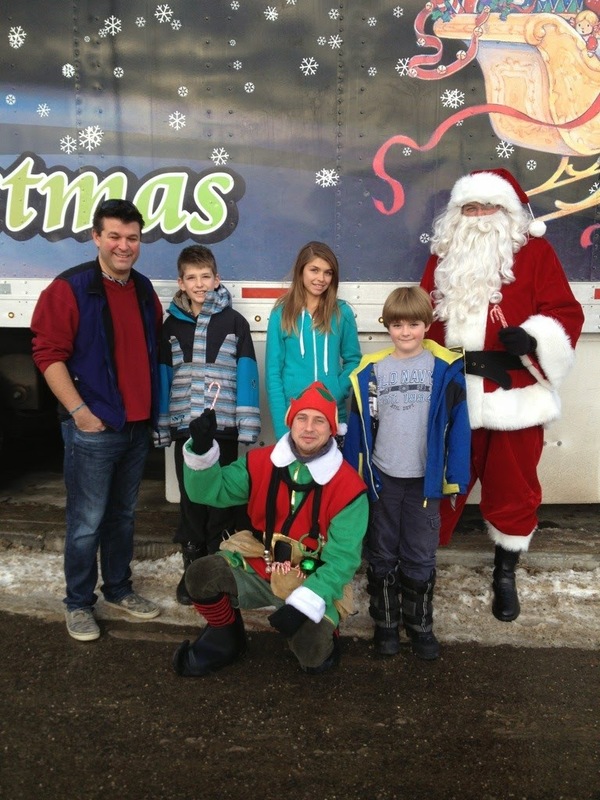 Dan is quite famous in Edmonton for living in trailers in support of the Edmonton food bank. We had Lyle take the trailer down on December 11 to put it in position, start the heater up so it would be all toasty warm for Dan and turn on the lights. 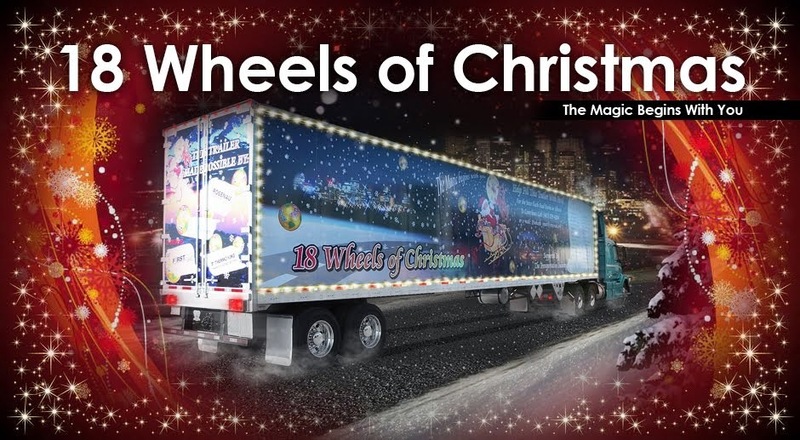 There is nothing prettier than the 18 Wheels of Christmas trailer at night!!! Dan arrived early in the morning on December 12 and proceeded to “move in” complete with a recliner chair an air mattress and warm bedding. He had it looking very comfortable. Dan then set to work setting up his collection station outside the main entrance to Save-On-Foods. Tony, the store manager, mentioned to Dan he would buy all his meals during his stay at the Save-On-Foods Inn. The weather was very agreeable for most of Dan’s time in the trailer. 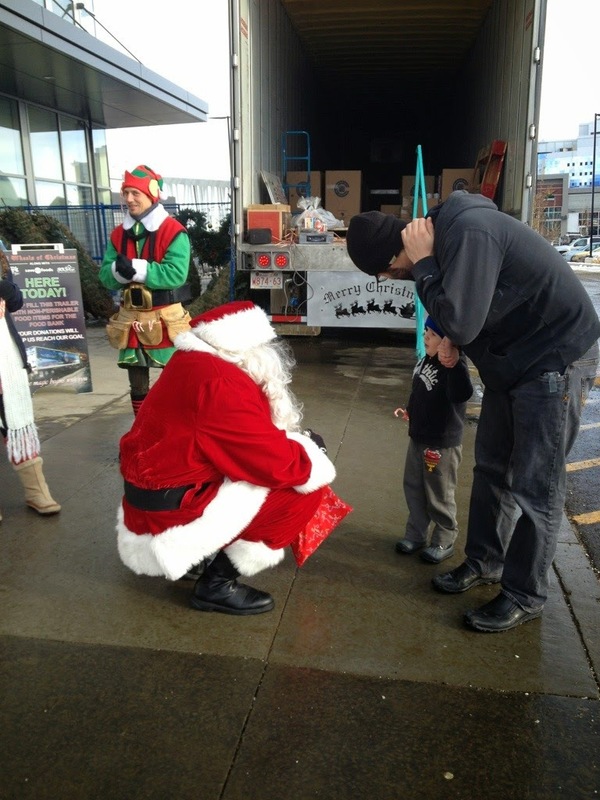 There was freezing rain on the Saturday but this only helped bring in the donations. 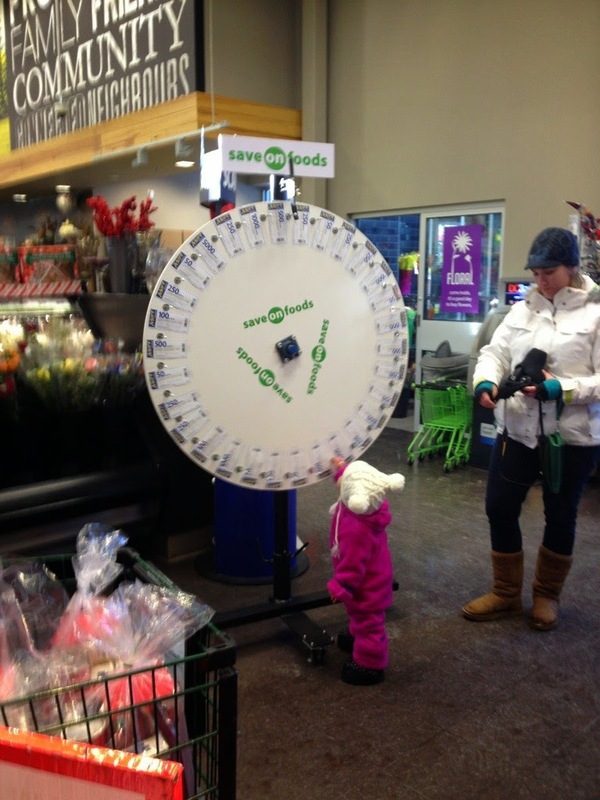 The store set up the now famous “Wheel of Fortune” for donors to spin to win Save-On-Foods MORE Reward Points, this always brings a crowd. We are proud to say for a first attempt we deem this event to be a success. Dan raised over 9300 pounds in food and turned over to the food bank $1453.31. Amazing News From Edmonton ! What amazing Generosity from our Company, Customers, Partners and Suppliers in Edmonton!! 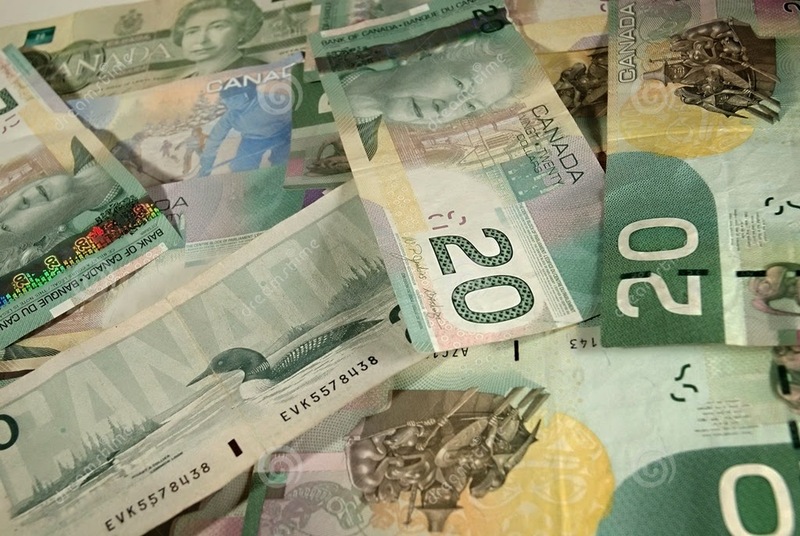 We previously told you that Edmonton was busy collecting donations and had thus far collected $9000.00. 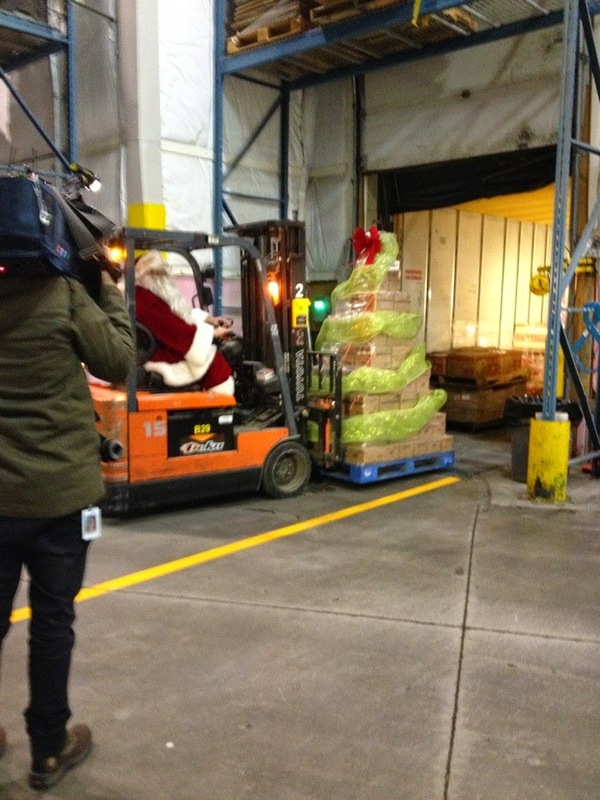 Well ......, they are in for a surprise, because, on Monday morning, the Edmonton Food Bank will be receiving an incredible $16,000.00 in cash and 10 boxes of food !!! This money will go a long way to helping many folks in need this year and make some special Christmas memories! A special thank you to all the folks on the 18 Wheels Team and especially the Coordinator, Sandra Bottorff for all your hard work. What an amazing total! We can't wait to see all of the totals put together for this year. It has been an incredible ride thus far. 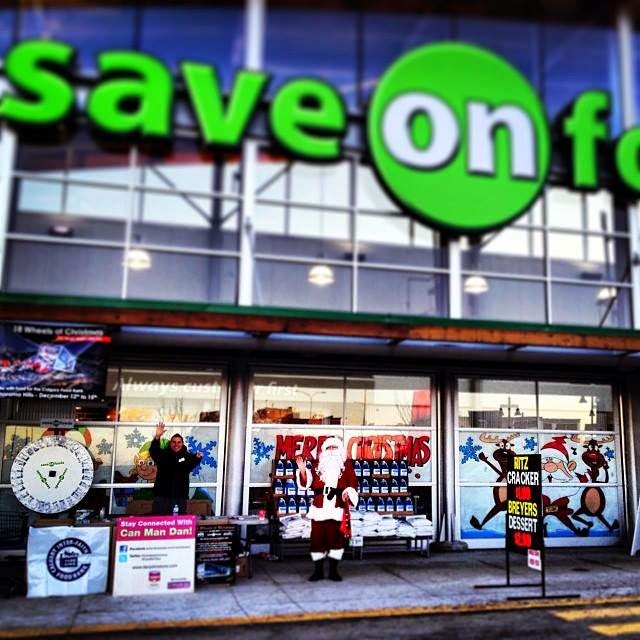 What an absolutely gorgeous day at Seton Save-On-Foods on Dec 6th. 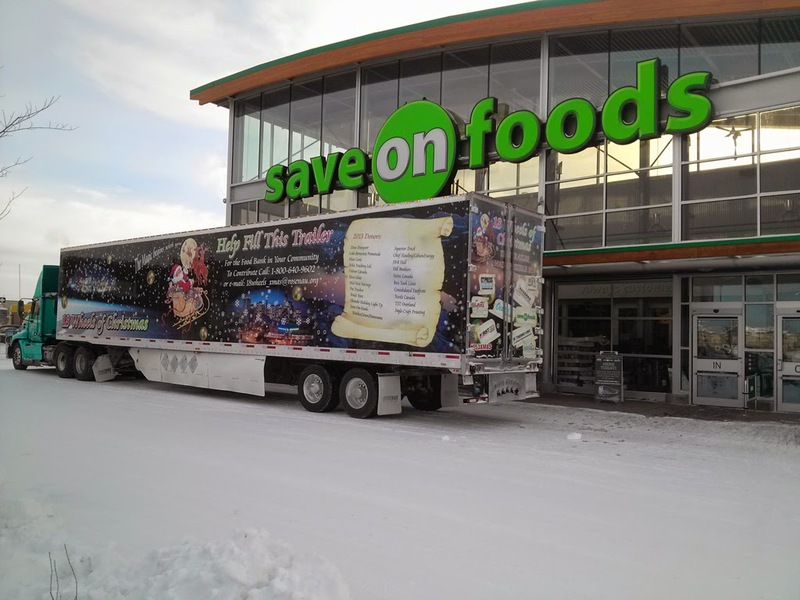 Our driver, Jonathon, placed the 18 Wheels trailer right outside save-on-foods front doors and right on the sidewalk. Perfectly placed. We set up all our gear then James and his crew set up all their gear. This of course is the now famous “Wheel of Fortune”. Skippy and Skipette did a terrific job of getting everyone’s attention and letting everyone know with each donation a spin to win up to 5000 Save-On-Foods More Rewards Program Points could be theirs. Everyone a winner!!!! 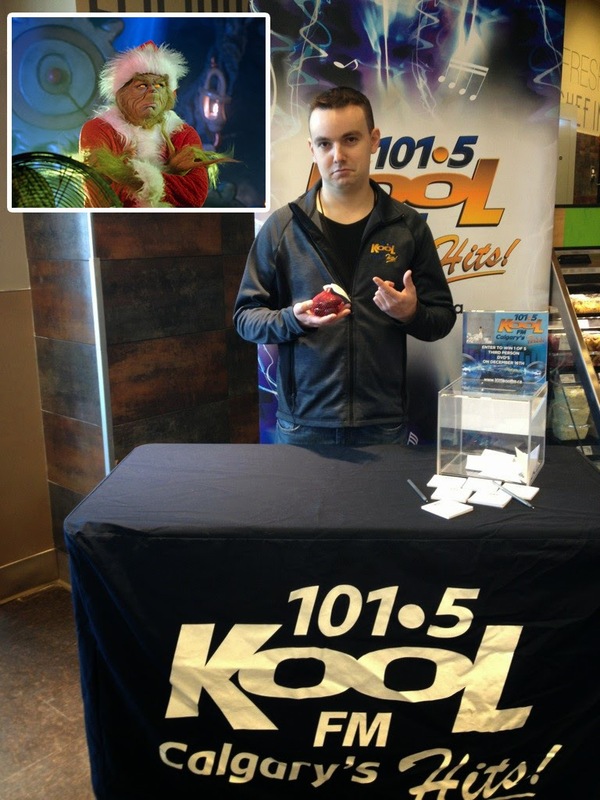 Kool FM and The Peak were on hand once again with their raffles for a chance to win One Republic concert tickets and/or tickets to the movie premiere of The Interview. 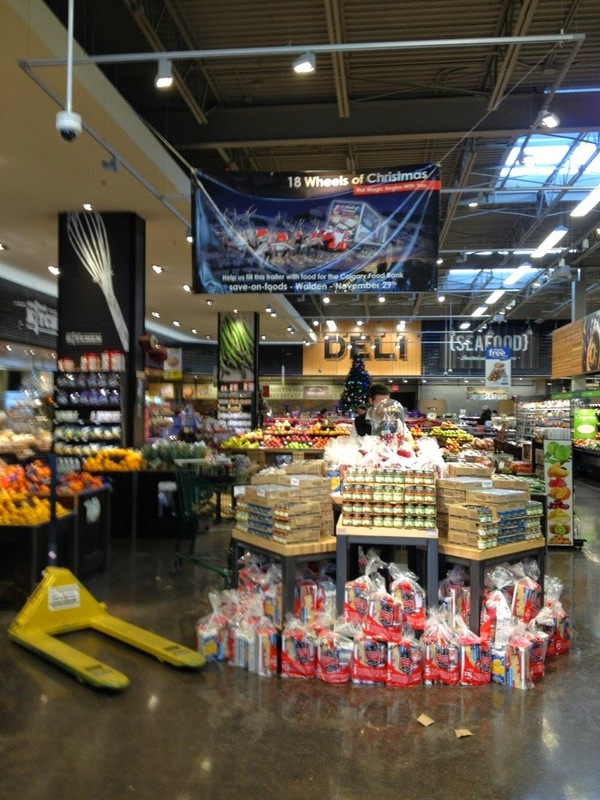 There was also the chance to win a Save-On-Foods shopping spree of $250.00. Donations were rolling in and as we were placing them in the trailer a couple came over with a donation baby formula at a guesstimated amount of $500.00. As if this wasn't enough, the Grey family showed up moments after with their cart full of peanut butter, soup and sauces to donate. When families do this together it is always a heart warmer. 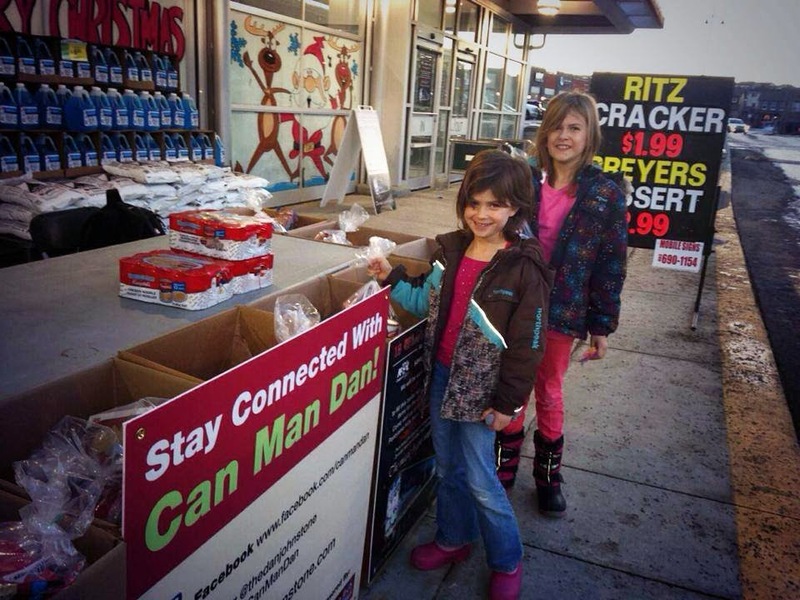 The Koopman family showed up with another surprise of cases of soup, juices and canned goods. This day was only getting better as a young woman showed up with bags of food she had purchased especially for this event. All she wanted in return was her bags back. Not only did we have food donations made by the people of this community we also had families with their kids in tow donating toys. We were full of laughs and surprises. Santa was busy with the kids and the Elves were getting into mischief like they always do. 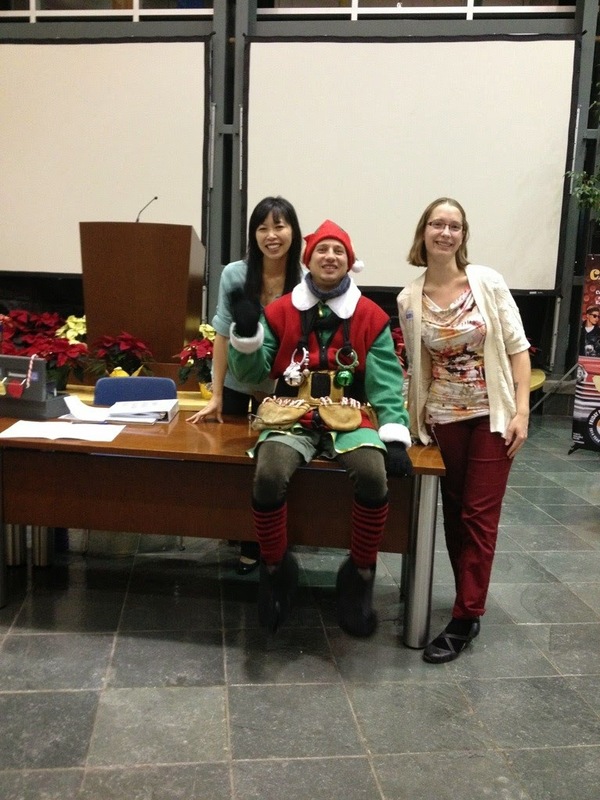 Our volunteer Diana was baiting the Elves into spinning the wheel and stopping at the big money prize of 5000 points. But Santa had to rein them in. We left at 4:00pm with a load of food and cash as well as a pyramid of the precious baby food. Thank you to the community of Seton!!!!! They will serve you your coffee this morning, and not know what you did for their two young children this upcoming Christmas Day. But we do. We recognize all the hard work, the preparation, the sacrifice, the hours you spent out in the cold, shaking hands and saying Thank You. Dressing up, making kids smile, waving until your arms hurt, losing count of the amount of times you climbed in and out of that trailer, the lost weekends, being weeks behind in your own holiday plans and shopping. To our Volunteers, know this....., every night that you pour your exhausted, sore body into bed, smile and know that you have personally made a positive difference in the lives of thousands of people across Western Canada today. How many people can say that? Thank You to all of You wherever you are. The Fluor Cares Committee and all those involved never disappoint. This company, but we will call them a Community as that is what they are, a Community, warmly welcomed us from the moment we arrived. Bonita had arranged for the trailer to be parked out front where it would be visible to the entire Sunlake Business Park. It was 6:00 am and very dark, the trailer was parked expertly by Lyle and beautifully displayed. We were set up in no time to receive donations. 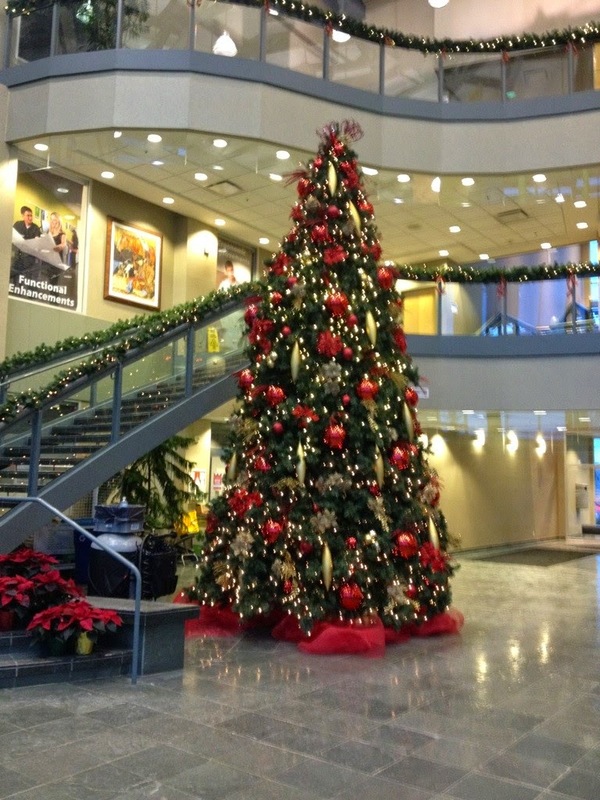 Fluor lobby all decked out! The idea is to wear jeans on this Friday. A donation of either food or money had to be contributed, if not, home you go to change. Of course the attraction to wear jeans to work is enough incentive to give. As the people started arriving for work it didn't take long to fill one food collection box then 2 and so on and so on, until we had 10 boxes filled to the brim in 3 hours. Santa could not make it this year, He was busy elsewhere which was o.k. as it gave Skippy a chance to shine and of course schmooze the ladies. A huge thank you goes to Bonita and the Fluor Cares Committee and to all the Fluor participants which includes Fluor offices in Quarry Park, Sundance 3 and 4 and of course the main office building. Your extreme generosity helped us to fill 12 food collection boxes and over $4,800.00 in cash which will in turn be used to purchase the always needed but often overlooked baby food and related items. 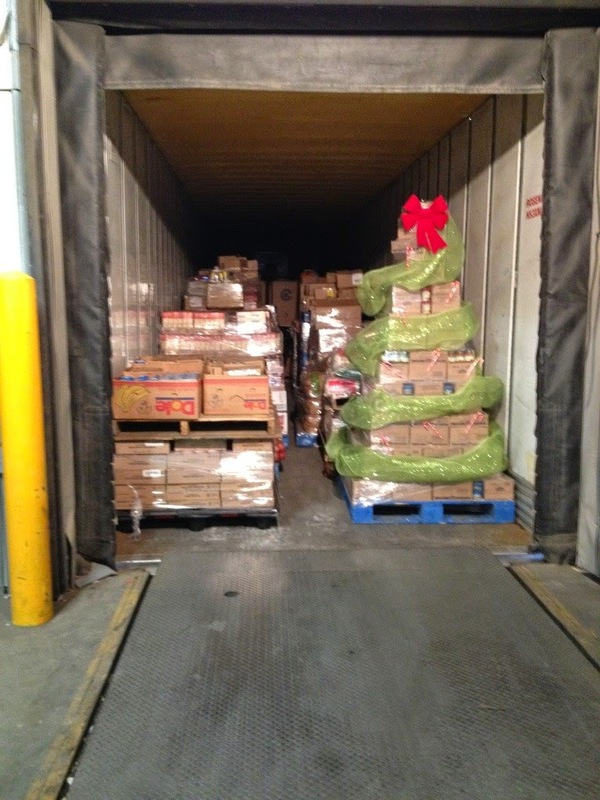 Thank you again from all of us at 18 Wheels of Christmas. Huge WOW!!!! To Doug and his staff. The tools were given to us to create a game show using the residents from the wonderful community of Walden. We were given a prize wheel with Save-On-Foods More Rewards program points. Each donation gave a chance to spin the wheel for points. Everyone a winner! 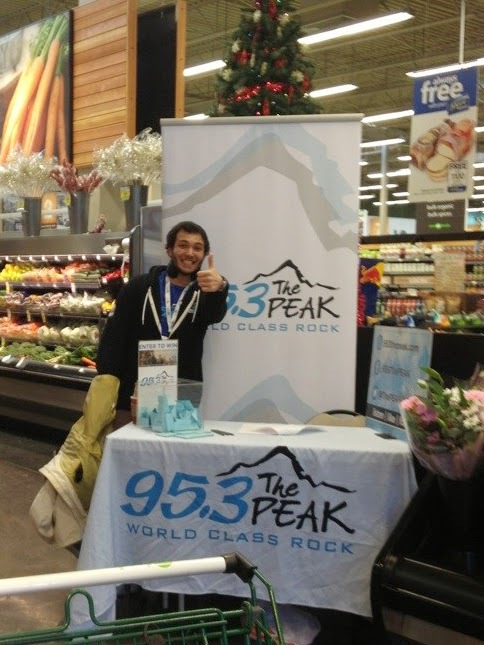 We had two radio stations on hand, 101.5 Kool FM was giving away a chance to win tickets to the premiere of The Interview and 95.3 The Peak a chance to win tickets to the One Republic concert in April. Skippy our Elf and his Mrs. we call her Skipette were a team to be reckoned with. Most everyone who came through the doors was enticed by this team to donate, spin and put their names in for the draws. Even babies had the chance!!!!! 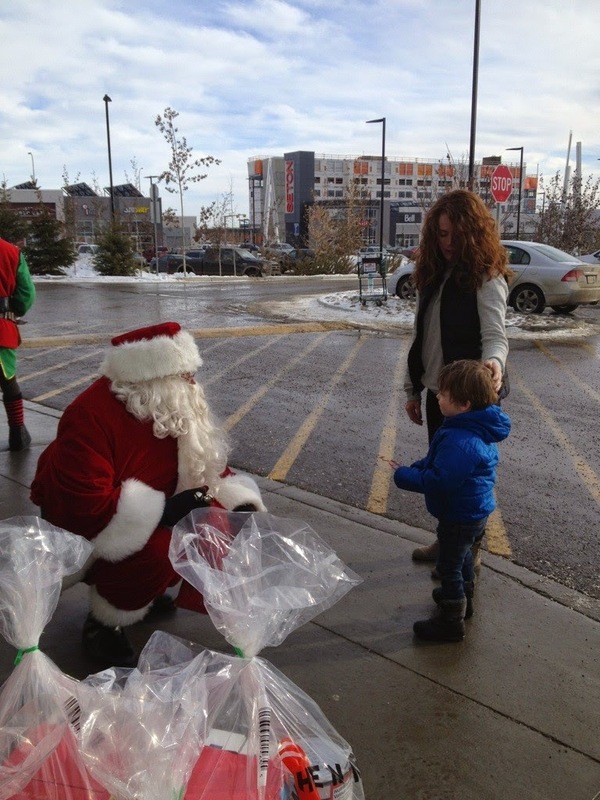 Santa’s appearance had a child’s eyes glued to him in wide eyed wonderment. The generous residents of Walden filled 14 food collection boxes. There were 126 pre-packaged hampers sold and donated. Cash for baby food. A huge surprise for us at the end of our 6 hour stint was 1/3 of a skid of baby food donated by Heinz. The only downer for this location was unfortunately Jordan from Kool FM. He was approached by a young lad who had purchased gum drops to be shared by the radio personalities Rayane, Lucas and the DJ Taylor Daniels. But no, Jordan the "Grinch In Training" spoke for everyone and told the youngster "no thank you" leaving the boy brokenhearted. Here comes Dad to the rescue explain his son had purchased this especially for them so once again candy was offered and this time everyone except Jordan shared the sweets. Jordan received a bag of coal. 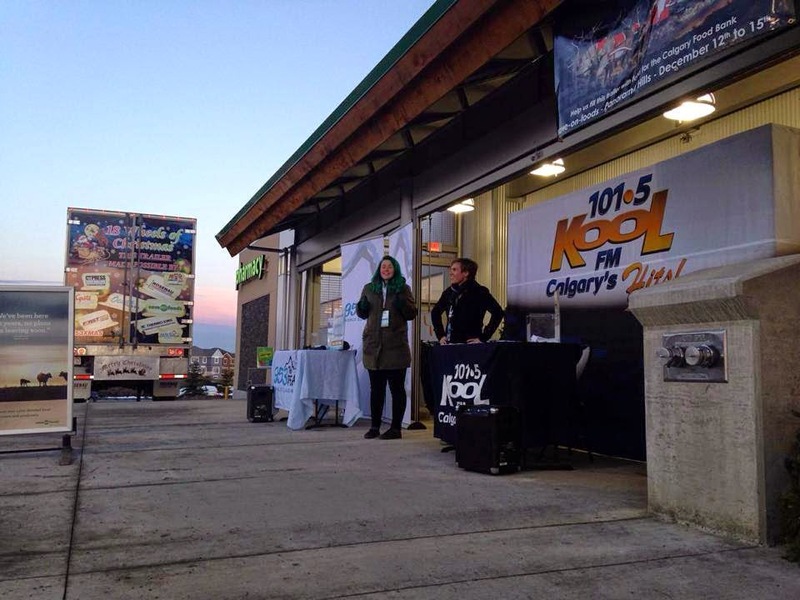 This year is the first that we have 101.5 Kool FM and 95.3 The Peak on hand to help us collect more donations for the Calgary Food Bank. 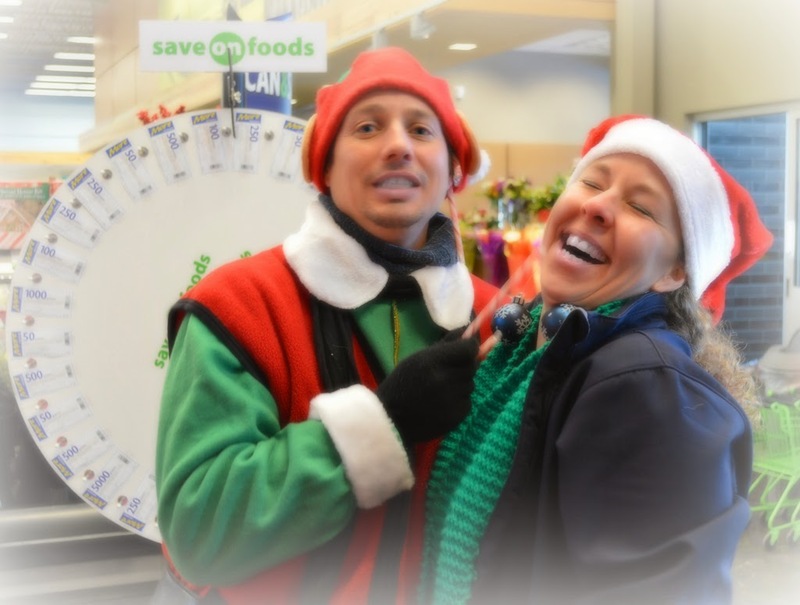 We are so grateful to have them and Save-On-Foods to help us give to those in need this Christmas. Edmonton is Powering their Donation Machine! Wow, Check this out ! 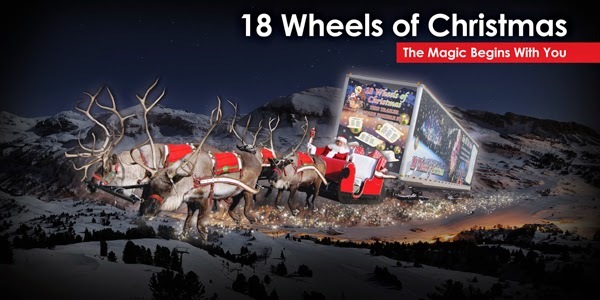 Edmonton is not going to be left behind in the race to make this one of the most successful 18 Wheels Of Christmas seasons ever! 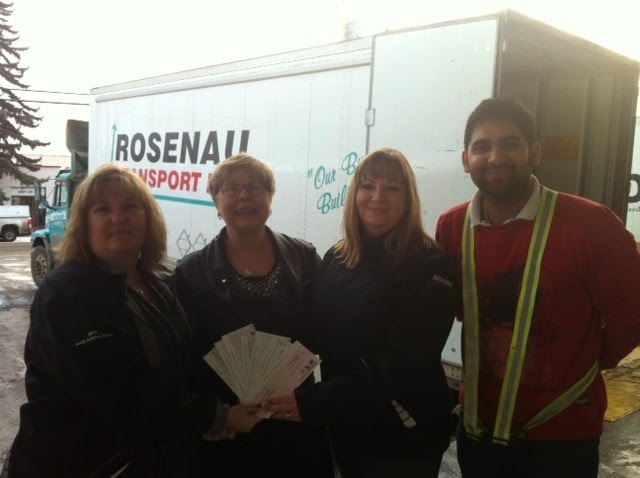 We received some exciting news this afternoon from 18 Wheels Coordinator Sandra Bottorff in Edmonton today! 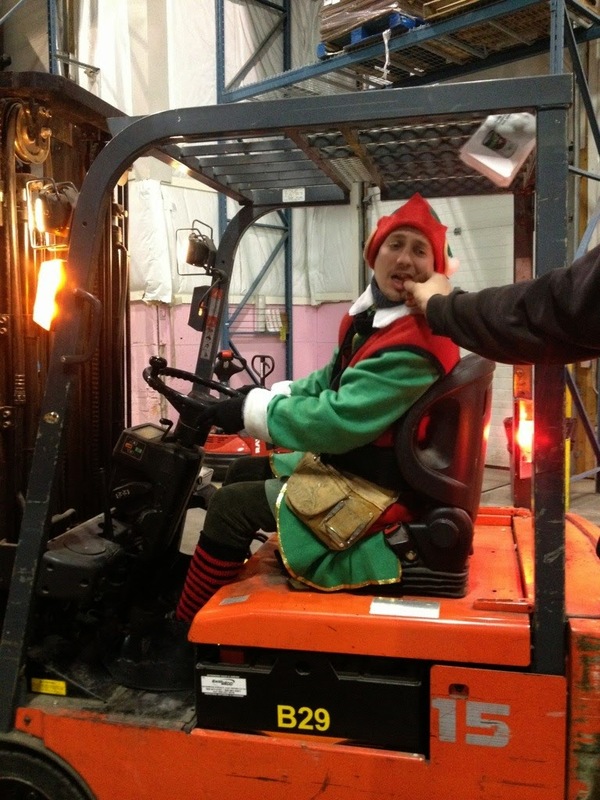 Santa’s Elves have been busy in Edmonton, and just like an 18 wheeler itself, the donations are rollin’ in .. ! 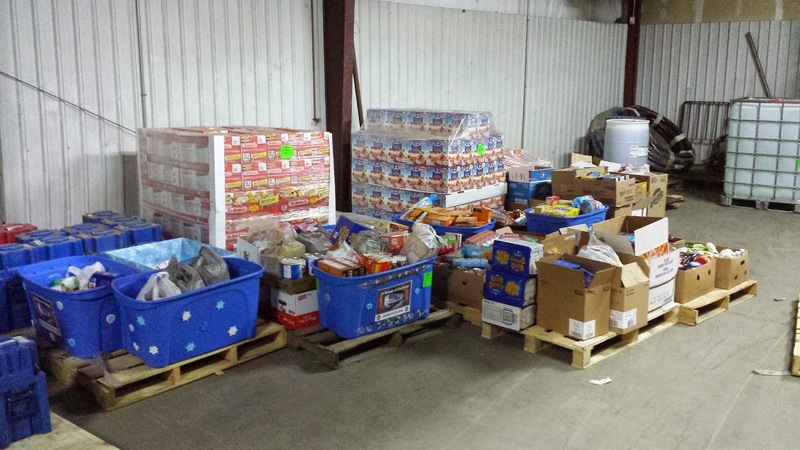 In just 72 hours we have received over $9,000.00 in monetary donations and one food hamper !!! Many thanks to Canadian Freightways, Edmonton Kenworth, Ocean Trailer, Majeski & Company, Kingpin Trailers, Thermo King, Benefit Link Group and Ledcor.